You might have noticed a lot of people were talking about the elections yesterday, especially on social media. Election and voting hashtags were trending all day long as people around the country hit the polls to vote for senators, representatives, governors and more. And while plenty of people were really excited to simply let their friends and followers know they had cast a ballot, several others had questions about how to find their polling place or the hours it was open. 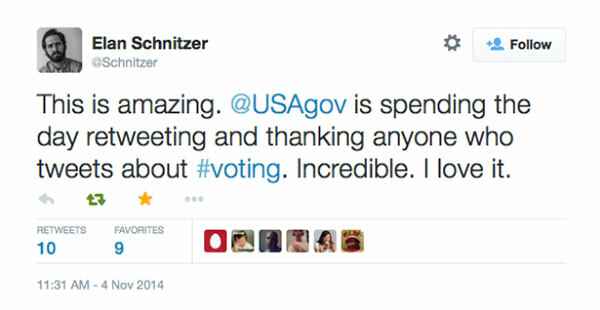 So the USA.gov social media team launched an election day real-time engagement effort to answer those questions and highlight just how important voting is. 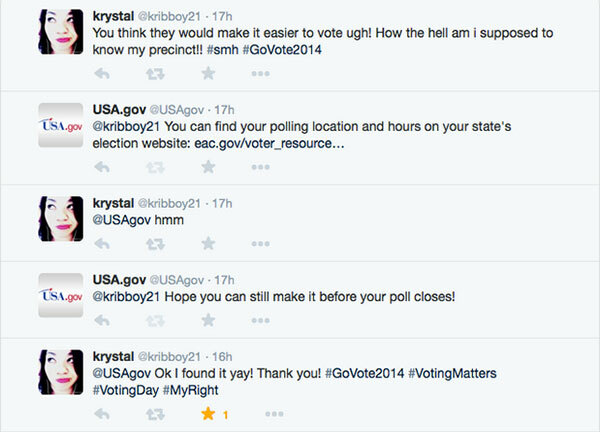 We monitored trending election hashtags on Twitter (like #Election2014 and #GoVote2014) keeping an eye out for tweets from people who needed help on election day. To spread the message of how important it is to get out and vote, we encouraged people to share their #ElectionSelfies with us, showing off those coveted “I Voted” stickers. It was such a simple thing for us to do on election day, and it dovetailed perfectly with our mission of helping connect people to government information and services. Plus it supported our goals of building relationships and increasing engagement. Most importantly, it created a great experience for the people that engaged with us. Through our small effort, we were able to humanize “the government,” and introduce new people to the USA.gov brand, while establishing it as a friendly and helpful place to go to find answers to government questions. Jessica Milcetich is a Social Media and Digital Strategist on the USA.gov Outreach Team at the U.S. General Services Administration (GSA). « Trends on Tuesday: Phablets to Top Tablets in 2015?